White Chocolate Bunny Ears: Jim Sande. Harvest Bell Ride (2010). Jim Sande. Harvest Bell Ride (2010). American composer Jim Sande has had one foot in the Pop/Rock world and the other in the contemporary minimalist genre for years. He has led bands such as The Executives, and Boy In The Button, performed as a classical guitar soloist, and produced several CDs that meld a Pop sensibility with modern classical music. Much of his work has been written for, recorded, and performed by, The Jim Sande Ensemble. That ensemble, in existence for 20 years, has included a variety of vocalists, percussionists, keyboard players, and guitarists. Sande is also an astute commentator on the financial and political aspects of life in the US. He shares these observations daily on his blog, Sande. As a solo composer, Jim has completed several CD's of carefully orchestrated chamber/Pop music, including Prim (2001), and Particle (2006), both of which collect instrumental and vocal pieces. With his current release, Harvest Bell Ride, Sande dispenses with the reliable conventions of popular music (vocals/guitar/drums) and dives into the deep waters of the virtual digital orchestra. 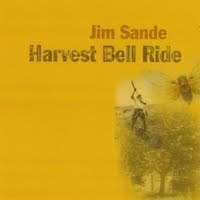 On Harvest Bell Ride, Jim Sande presents a collection of compositions that display his skill at orchestration, balance, and thoughtful arrangements. Ideas flow at an accessible pace, the sections of each piece relating to each other as reflections or contrasts to what preceded. Sande employs a vast array of timbres with a sensitive touch. Textures remain light and transparent. The instrumentation is never occluded by density. We can savor individual parts as they are fitted into ensemble structures. Although orchestral in nature, the effect is more chamber orchestra, as one can sense the air between the lines, which may have resulted from the mix of varying reverb settings. It's a CD that one should settle into and spend time with, as the pieces seem to benefit from being taken as a whole, rather than piecemeal. In that way, it is more of a complete work, rather than a series of random tracks. All of your work on disc includes at least a few vocal pieces, did you intend from the beginning of this project not to have any? Yes, I planned on making an all instrumental CD. The work on "Harvest Bell Ride" is less about song form and more about longer forms and through composed music. Pretty much all of my singing has been in the context of my music work with songs. The songs on my previous CDs and the music on "Harvest Bell Ride" are still basically put together in the same way though, part by part, section by section. So in this sense the songs and longer works are similar. Overall for me its all about trying to make a complete piece of music. If you sing it has to work as a totality, if you use found or modified sounds its still about the total overall piece. I work on songs and long form music from the perspective of a music writer/composer rather than as a singer or instrumentalist. On the other hand when I am working and piecing things together, I find a few instrumental parts by singing a melodic part for an intended instrument. So there is singing in this way throughout all of it. This new record, for the most part, features the sound of acoustic instruments that we associate with classical music. Was finally having access to convincing digital reproductions of these instruments any impetus for the composition of the pieces? Yes, as you know when you get a new toy it can be inspiring. There's something to be said about that too. I like to try to freshen up at least some of my palette of sounds when I start on a new disc. If I didn't do that I would still be working with a Roland XP-10. This is the thing right. When we work with computers everything is evolving, sounds change, some samples get better, especially the way a company like Vienna Instruments can sample orchestral instruments. There are very smart and talented people out there who have a good sense about how to do these things like make sample libraries and they learn new tricks and keep upgrading. I do like details in sound. If the sampled violin gets closer to a real violin, well that's just heavenly. Still it's not the same. There are limitations. However I can't bring myself to use sampled guitar sounds. I couldn't do that. But I have no conscience about using virtually every other instrument from a sampled library. If I am going to use guitar, I have to play a real guitar. In truth, I do some manipulation to many of the samples, either with panning, delays, eqs, and sometimes filters. The sounds from orchestral instruments like the oboe or bassoon are so rich. They make a wonderful basis for electronic manipulation because they are so rich. In your own description, the music on Harvest Bell Ride has something to do with forms of contemplation. Was this intentional from the outset, or was it more something that emerged as a theme during the writing process? The theme emerged while I was in the process of working on the disc, maybe about 25% of the way into it. This is something that I have learned to do over time and the years. Its not a comfortable thing to do, but just start working without a clear picture and see where it will lead you. It seems to work for me so far on the personal level. I hope I'm not jinxing myself by saying this. The disc has the theme of these non formal contemplative activities that we all do without thinking of the activity as being contemplative. An example might be when we watch a fire in a fireplace, we can let go of our major concerns, soften the intensity of our worries, and open up some healthy space in our minds. As the fog about where this music project was going away and this idea became clearer in my mind, the work on the music becomes like a type of research. You begin thinking about the theme, you might contemplate the idea when you're out for a walk, and you do this over a period of time and learn something. Music writing like any creative activity can do this, it can teach you something if you're willing to suspend at least a part of your absolute control over the process. You might even go and do some supportive reading and such. So I got a new disc out of the process, but I also got a better understanding about one facet of our shared human behavior and how we get on and along in our lives. Its helpful. Through most of your career, people have remarked on your skills as a guitarist (Sande was a student of renowned classical guitarist, Oscar Ghiglia). Apart from one instance, the guitar is nearly absent from this recording. Are there limitations to that instrument that made it inadequate for your current work? Or did it just not sound right in this context? My history with music starts with voice as a choir boy in grammar school, guitar as a tweener, and then teen on piano. My first idea about what to achieve with music was to be a decent guitar soloist in the style of the rock idols. In music school the spark of wanting to put together orchestral work began when we went through the history and theory of Western music. I approached this for a long time with classical guitar study as a way into classical music. This incidentally has its limitations. So I have had this intention for a long time to work on producing orchestral music. When I'm put on the firing line and I have to choose what my main interest in music is, its music writing, even though everybody around here keeps asking me if I still play the guitar. Over the last ten years I have been formally studying piano again, going through classical repertoire. The way into putting together orchestral work on the do-it-yourself computer is through the keyboard controller with MIDI using sampled orchestral instruments. That's the name of that game. I never even tried a guitar MIDI controller. Guitar as a composing device has its limitations for me. 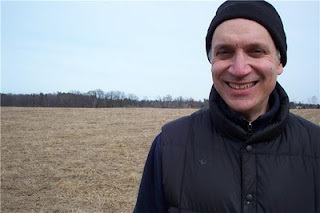 A lot of my music is harmonically driven and the notes are simply clearer and more understandable even simply looking at it on a keyboard rather than a guitar, and I know my way around the guitar reasonably well. The guitar seems to impose patterns and shapes that are idiosyncratic to the guitar which is perfectly fine and nice, but it has problems for me. People have obviously done amazing things with writing on the guitar. If you write music on the guitar, it's going to be that, guitar music, whether its clean, distorted, harmonized, digitally manipulated, etc etc. On the other hand, I once heard that Berlioz wrote on the guitar. After that comes, I don't know maybe Villa Lobos. There are others and the work is wonderful. I do have the intention and spark to do a guitar based disc. I am curious to see if the approaches to music that I've learned recently will translate in guitar music. How much extra work is needed to mix what is essentially a chamber orchestra, compared to a Rock band arrangement? They are different animals. A rock mix is strong and drum punchy and the method to do that is an imperative for the music. Since this disc was primarily orchestral sounding I decided to forget about the rock mix completely. Basically I hit on the idea of mixing each section pretty much as I completed that section, otherwise it would become a nightmare to go back and mix 60+ tracks which is the number on the title cut. So if I got an introductory section to my liking note-wise, I would immediately pan the instruments and do a 90% done mix before I would move on to the next section including eq, reverb, and such. Incidentally panning in my opinion is underrated. The panning effects in DAWs are outstanding and in themselves can create unique sounds, especially the dynamic panning effects. Also I would color code each section's grouping of instruments. You need to keep it orderly or chaos will ensue. I found that doing the mixing as the section was completed would reveal what instruments I wanted to highlight. This helped if there was an abrupt segue, one without preceding space or silence, then the next dominant instrument could be centered with supportive parts surrounding. At the end of the process I would go through the piece often many times to remove any internal digital distortion as best as I could and then to finally add a little bit of compression to give everything a slight lift. Inter-channel internal distortion is problematic in DAWs. When your studio is based around a laptop, the meters do not indicate internal distortion so you have to listen closely and sometimes raise the volume a bit otherwise you can miss it. That's my experience so far. Some people recommend using -3 as the base setting instead of 0 to help with this. The short answer is yes, it takes a lot of time, and you need to have an orderly plan or else it will get messy fast especially when you want to mix. Having a virtual orchestra at your fingertips allows you to play any instrument, which one was the most fun to try out? That's easy. Its the saxophone. Vienna has very good sax sounds. When I find the sampled sax sound that has the honking and polyphonic Sam Rivers/Ornette articulation, I will get it without question. We may like the guitar and the piano but to try to emulate some inspired free jazz sax player, that would be a real joy in the context of any type of music.